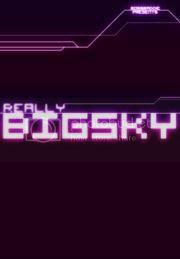 Really Big Sky is a proper, red-blooded, co-op enabled, mind melting, eye bursting, arcade inspired space shoot ‘em up! Play with up to 3 buddies as you blast your way through the universe leaving nothing but destruction in your wake as you plough through waves of bad aliens! Can you save [your planet] from utter annihilation? Of course you possibly could, especially when you’re armed to the teeth with gloriously overpowered weaponry! They’ve given you a really splendid spaceship and they’re not expecting it back.